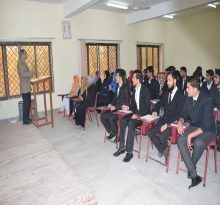 The qualification for admission in Diploma Course: HSSC, Medical Laboratory Technology, is Secondary School Certificate (SSC) or Matriculation in science group, with at least 1st division (minimum 60% aggregate marks) or equivalent foreign qualification approved by Inter-Board Committee of Chairman (IBCC) Islamabad. Note: The details are also given in the advertisement for the admission. The qualification for admission in Degree Course: B.Sc (Hons. ), Medical Laboratory Technology, is Higher Secondary School Certificate (HSSC) or F.Sc in Pre-Medical group or equivalent foreign qualification approved by the Inter-Board Committee of Chairman (IBCC) Islamabad. The criteria will be announced by the Shaheed Zulfiqar Ali Bhutto Medical University(SZABMU), PIMS, Islamabad, at the time of admission. All candidates are eligible to apply for admission, regardless of gender, in diploma and degree courses at CMLT. As the medium of instruction at CMLT is English, the foreign candidates are required to submit English qualifying certificate from Pakistan Embassy in their respective countries, or through the British Council or any other recognized agency.